Following Clover and Le Grand Restaurant, chef Jean-François Piège has opened another restaurant, Clover Grill, on 6, rue Bailleul in the 1st arrondissement. It is devoted to wood-fire grilled fare and features a cocktail bar. Clover Grill, 6, rue Bailleul, 75001 Paris, 01 40 41 59 59. Alan Geeam, a fine dining restaurant, has opened just off the Arc de Triomphe. Expect refined cuisine with multiple influences from a chef who lived in Lebanon, Liberia and the U.S. before settling in Paris. Alan Geeam, 19, rue Lauriston, 75016 Paris, 01 45 01 72 97. Marc Veyrat, the chef and owner of a fine dining restaurant in the mountainous region of Haute-Savoie, La Maison des Bois, has opened his first Parisian establishment. 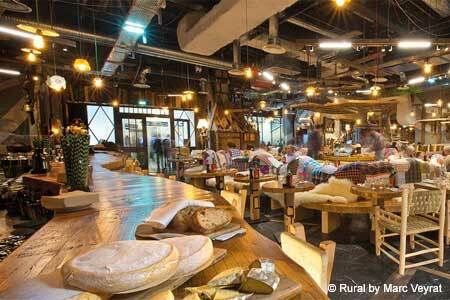 Located in the Palais des Congrès, Rural by Marc Veyrat promotes organic food in a congenial setting. Rural by Marc Veyrat, 2, place de la Porte Maillot, 75017 Paris, 01 72 69 03 03. Eric Frechon (Hôtel Le Bristol) has renewed the concept of the Publicis Drugstore Brasserie. The restaurant is open 7 days a week until 1 a.m. at the top of the Champs-Elysées. Publicis Drugstore Brasserie, 133, av. des Champs-Elysées, Paris 75008, 01 44 43 77 64. Chatomat, a bistro tucked in a little street of the Ménilmontant neighborhood, has closed. Mijo T has taken over the space. Chatomat, 6, rue Victor Letalle, Paris, France 75020, no phone.